This still image is a single frame from an immersive, 360-degree, ultra-high-definition visualization that allows viewers to view the center of our Galaxy as if they were sitting in the position of the Milky Way’s supermassive black hole (Sgr A*). 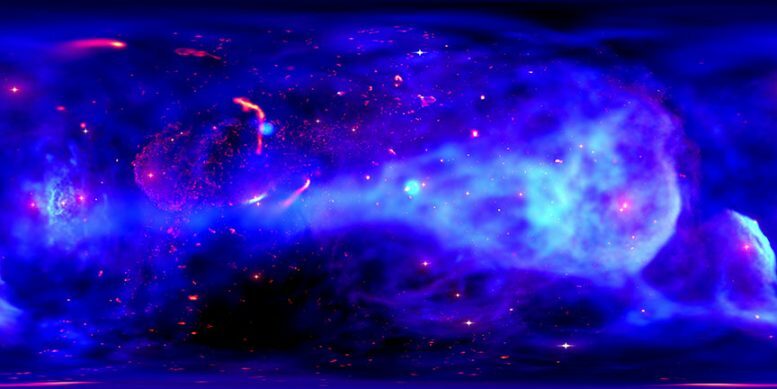 By combining NASA Ames supercomputer simulations with data from NASA’s Chandra X-ray Observatory, this visualization provides a new perspective of what is happening in and around the center of the Milky Way. It shows the effects of dozens of massive stellar giants with fierce winds blowing off their surfaces in the region a few light years away from the supermassive black hole known as Sagittarius A* (Sgr A* for short). A new immersive, 360-degree, ultra-high-definition visualization allows viewers to view the center of our Galaxy as if they were sitting in the position of the Milky Way’s supermassive black hole (Sgr A*). By combining supercomputer simulations with Chandra data, the visualization shows the effects of dozens of massive stellar giants with fierce winds blowing off their surfaces in the region covering a few light years surrounding Sgr A*. Blue and cyan represent X-ray emission from hot gas with temperatures of tens of millions of degrees, while the red emission shows ultraviolet emission from moderately dense regions of cooler gas with temperatures of tens of thousands of degrees, and yellow shows the cooler gas with the highest densities. Dr. Christopher Russell of the Pontificia Universidad Católica de Chile (Pontifical Catholic University) presented the new visualization at the 17th meeting of the High-Energy Astrophysics (HEAD) of the American Astronomical Society held in Monterey, Calif. NASA’s Marshall Space Flight Center in Huntsville, Alabama, manages the Chandra program for NASA’s Science Mission Directorate in Washington. The Smithsonian Astrophysical Observatory in Cambridge, Massachusetts, controls Chandra’s science and flight operations. 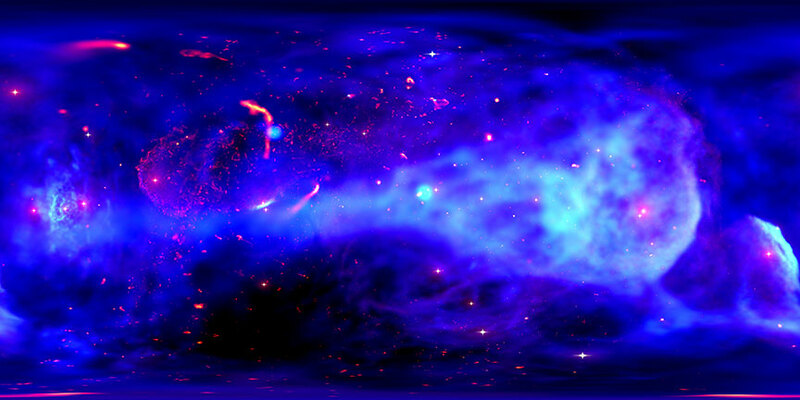 Be the first to comment on "New Visualization Provides Ultra HD View of Our Galaxy Center"